Does fractal mathematics offer a better way to understand market risk? The traditional test of understanding how something works is to take it apart and then rebuild it. If the clock still keeps time afterward, there is a good likelihood that the tinkerer figured out how it works. In much the same way, economists and technical analysts have struggled to model the financial market in an attempt to better understand how it works. The problem is that in the real world causes of market movements are usually obscure. Critical information is often unknown at the time or unknowable, concealed, misrepresented, and/or misunderstood. “To all the complexity of the physical world of weather, crops, ores, and factories, you add the psychological complexity of men acting on their fleeting expectation of what may or may not happen,” explains mathematician Benoît Mandelbrot. Modern finance theories accept that prices are not predictable but maintain their fluctuations can be described by the mathematical laws of chance where risk is measurable and manageable. This is the basic principal behind the use of the bell curve and standard deviations in managing market risk. But the math doesn’t fit reality. Long-tail events happen with much greater frequency and at much greater variation than the bell curve accommodates. Volatility, measured by the standard deviation between returns of a security and/or a market index, is also a poor measure of risk in that it equates both gains and losses as risk—contrary to the attitude of investors, who view risk as the potential for loss. Is there a better way to measure and understand the risk of financial markets? Benoît Mandelbrot offered a new direction through the application of fractal mathematics to modeling the financial markets. Without getting too deeply into the mathematics of fractals, his research offers a number of findings that reinforce the concepts of active investment management. Mandelbrot was born in Poland, but his family migrated to France in 1936. After World War II, he studied mathematics at universities in France and the U.S., receiving a master’s degree in aeronautics from the California Institute of Technology. After obtaining his Ph.D. in Paris, he began a 35-year career at IBM, gaining access to the best computing power of the day. Mandelbrot maintained that things typically considered to be “rough or chaotic,” like clouds or shorelines, actually had a “degree of order.” Their visual complexity could be created from simple rules. Resulting from this belief was the development of fractal geometry and its application to fields as diverse as astronomy, fluid mechanics, bioengineering, health care, telecommunications, computer science, surface physics, natural sciences, architecture/design, and much more. A fractal is a pattern or shape whose parts echo the whole. A fractal is a pattern or shape whose parts echo the whole. Fractals can be thought of as a form of geometric repetition, “in which smaller and smaller copies of a pattern are successively nested inside of each other, so that the same intricate shapes appear no matter how much you zoom in to the whole,” explains renowned computer scientist and physicist Stephen Wolfram. Why does this matter to active investment managers? In 1961, Mandelbrot began a study of cotton prices, using computers to look for patterns. Later, he applied the results of that study to the broader market and market segments. His conclusion: The very heart of financial market behavior is fractal. Utilizing fractal mathematics, Mandelbrot created market simulations that matched the characteristics of the financial markets—from volatility to patterns of advance and decline, cyclical movement, and other mathematical relationships. While his simulated charting could not be used to predict future movements, it helped recognize characteristics of the market dramatically different from those assumed under the traditional thinking of modern finance theory. Price changes are not independent of each other. Many financial price series have a “memory” of sorts. Today does influence tomorrow. Markets are inherently risky and always will be. Extreme price swings are the norm, not aberrations that can be ignored. Bubbles and crashes are characteristic of markets. They are the inevitable consequence of the human need to find patterns in the patternless. Market timing matters greatly. Big gains and losses concentrate into small packages of time. Trouble runs in streaks. Market turbulence tends to cluster. Periods of big price changes group together, interspersed by intervals of more sedate variation. Market time is relative. Markets operate on their own “trading time,” speeding up the clock in periods of high volatility and slowing it down in periods of stability. Markets mislead. People want to see patterns in the world. It is how we evolved. We see patterns where there are none. Markets in all places and ages work alike. How do these conclusions have practical application for investors? Perhaps most important is the knowledge that large price changes tend to be followed by more large price changes, positive or negative. And that small changes tend to be followed by more small changes. Volatility clusters. When financial storm signs are up, trim your sails and avoid large bets. Risk management is critical for long-term investment success. In his book “The (mis)Behavior of Markets,” Mandelbrot comments that professional traders characterize the market as slow or fast; they already recognize the dependence of current prices on the recent past; their personal experience tells them that prices are not random, nor are prices efficient over the short term. While Mandelbrot maintained that financial prices are not predictable and not controllable, he believed that through the tools of probability, investors can evaluate the odds for or against some outcome. But those tools cannot be the discredited use of the bell curve and standard deviations. While forecasting prices may be perilous, with fractal mathematics one can estimate the odds of future volatility. Mandelbrot never solved the puzzle of predicting market movements. But he did create an effective method for understanding the risks of holding a stock over different time periods that can be used in making financial decisions. And in the process, his work further questioned the credibility of modern finance tenets, including modern portfolio theory, the efficient market theorem, the capital asset pricing model, random walk, and even the Black-Scholes approach for option pricing. When you take away the logic for those approaches, active investment management becomes even more logical as the right approach to investing. The application of fractal geometry to the financial markets brings mathematical proof to the belief of active managers that the market moves in patterns—with periods of extreme risk when risk management should be used to the benefit of individual investors. 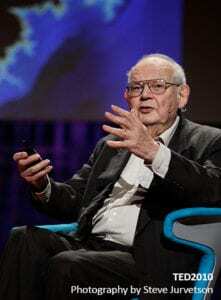 Benoît B. Mandelbrot was a Polish-born, French and American mathematician and scientist. He is recognized for his contribution to the field of fractal geometry, which included coining the word “fractal,” as well as for developing a “theory of roughness” and “self-similarity” in nature. He had a distinguished 35-year career at IBM in primary research, where he became an IBM Fellow, and held several important academic positions over the course of his career. The opinions expressed in this article are those of the author and do not necessarily represent the views of Proactive Advisor Magazine. These opinions are presented for educational purposes only. This article was first published in Proactive Advisor Magazine on September 17, 2015, Volume 7, Issue 11.